BOULLÉ, HÉLÈNE, dite de Saint-Augustin (Champlain), founder of the Ursulines of Meaux (France); b. 1598 in Paris, daughter of Nicolas Boullé, a secretary in the king’s household, and of Marguerite Alix, both of whom were Calvinists; d. and buried 20 Dec. 1654 at Meaux. Of the four Boullé children Hélène was the most interesting. In 1610 she was given in marriage to Samuel de Champlain, 31 years her senior. As she had not yet reached the age of consent, the marriage contract required a lapse of two years before cohabitation of the couple. At first persistent in her beliefs, the young woman studied her husband’s religion and adopted the Catholic faith at the age of 14. 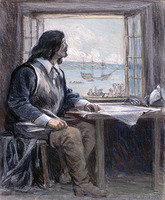 In 1620 she decided to accompany M. de Champlain to Canada. At Tadoussac the traveller met her brother Eustache, who had been in America since 1618. As Champlain was almost continuously occupied with his duties as a commander, his wife found herself isolated and out of her element in an environment so different from Paris. Her habits did not lead her to frequent Mme Hébert [see Rollet] and her daughter, and she sought occasional diversions among the Indians, who admired her face, her clothes, and especially the mirror hanging at her belt. After four years of exile Mme de Champlain returned to France for ever. From a distance she continued to watch over her husband’s interests; in his name she instituted proceedings against Guillaume de Caën (1627), and ordered him to pay emoluments to Champlain. While her husband was still alive Hélène formed the intention of becoming an Ursuline nun. Champlain’s death, which occurred suddenly on 25 Dec. 1635, left her free to carry out her plans, but various affairs delayed for 10 years her retirement from the world. Amongst other troubles were those occasioned by Champlain’s will, which designated Notre-Dame-de-la-Recouvrance as the heir to all his property. Mme de Champlain, who had no liking for legal squabbles, gave up the rights conferred upon her by her marriage contract, and a first cousin, who had had the will set aside, won the day. 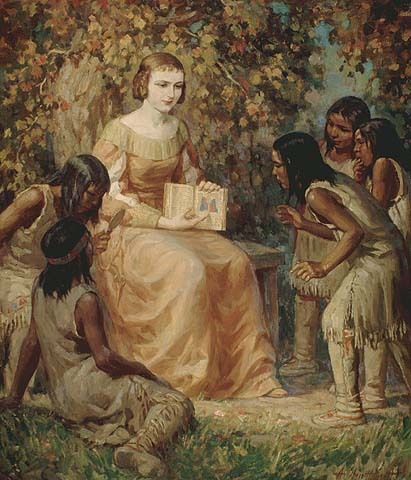 In November 1645 Hélène de Champlain entered the monastery of the Ursulines of Paris. It was there that she took the white veil under the name of Sister Hélène de Saint-Augustin. Because of her age, and of the independence to which she was accustomed, she apparently found the yoke heavy. While still a novice – which supports our conjectures – she left the convent of the Faubourg Saint-Jacques to go and found a monastery in the town of Meaux. The Chroniques de l’Ordre, somewhat inclined though they are to fulsome praise, do however say that Mother Hélène de Saint-Augustin had to endure heavy trials which her lively temperament made doubly painful to her. She died in odour of sanctity on 20 Dec. 1654, after a week’s illness. Les Chroniques de l’Ordre des Ursulines (Paris, 1673). JR (Thwaites). Morris Bishop, Champlain: the life of fortitude (New York, 1948). Bourde de la Rogerie’s article in Société archéologique d’Ille-et-Vilaine, Bulletin, LXIII (1932), published separately as Hélène Boullé, femme de Samuel Champlain (1938). 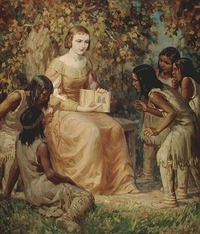 Faillon, Histoire de la colonie française, I. Robert Le Blant, “La famille Boullé, 1586–1639,” RHAF, XVII (1963–64), 55–69; “Le testament de Samuel Champlain, 17 novembre 1635,” ibid., 269–86. 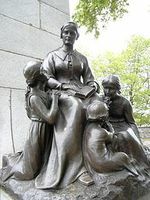 Marie-Emmanuel Chabot, o.s.u., “BOULLÉ, HÉLÈNE, named de Saint-Augustin (Champlain),” in Dictionary of Canadian Biography, vol. 1, University of Toronto/Université Laval, 2003–, accessed April 24, 2019, http://www.biographi.ca/en/bio/boulle_helene_1E.html. Author of Article: Marie-Emmanuel Chabot, o.s.u.